The heat is on in Des Moines! Senate leadership, concerned about their re-election chances if they keep killing gun bills, are starting to move some pro-gun bills in sub-committee as I type this. It’s no surprise, they know they need something to campaign on this Fall to avoid the wrath of gun owners. More on this fight as it develops. In the meantime, make sure you’re involved in this fight by getting involved in the work of Iowa Gun Owners this weekend at one of the two shows we’re coming to this weekend! This would be an excellent chance for you to come by and join Iowa Gun Owners (and pick up your free T-shirt in the process), pick up a free IGO decal, and grab some free “No Guns – No Money” business cards. It would also be an excellent time for you to get involved in our fight to advance Stand-Your-Ground law here in Iowa — just as thousands of other Iowans did these past few weekends at gun shows all over Iowa! While it may not seem like it, the 2016 elections are just around the corner here in Iowa and now is the time for your legislator to stand up for your Second Amendment rights! 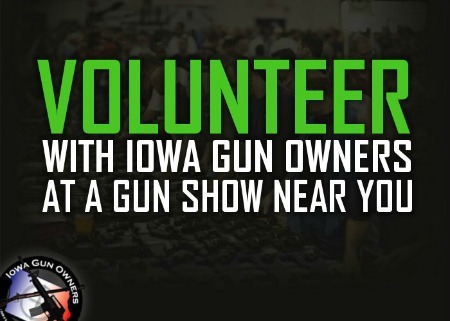 And if you are able, Iowa Gun Owners is looking for a few more volunteers to help us at our booth. Our volunteers never have to pay admission to the gun show and you’ll get a free IGO hat or an IGO t-shirt if you can stand with us for a 4 hour time block. If you’re interested, please click here and someone from our office will be in touch. In addition, take a look at this jam packed schedule of gun shows that Iowa Gun Owners will be a part of over the next couple of weeks! So whether you want to volunteer at one of these towns, or just want to stop in and get involved in our fight to protect and advance the 2nd Amendment, know that we’re coming to gun shows all over the state! Central Iowa Fairgrounds 1308 E Olive St. So again, whether you can help out this weekend or at any one of the gun shows listed above, we would be honored to have your support. Just click here to choose the location and time that best suits your schedule and someone from our office will contact you. Again, Iowa Gun Owners will be at the gun show in Council Bluffs and Davenport this Friday and Saturday — come on out and join our fight to defend the Second Amendment in Iowa! P.S. Gun bills are on the move here in Des Moines — as the Senate is feeling the heat from gun owners! Stand with us in our fight to defend the Second Amendment by getting involved in gun shows in Council Bluffs, and Davenport! All the details on locations and times are listed above! Stop in an join in the 2nd Amendment fight and while you’re there, you can pick up a free decal, sign your Stand-Your-Ground law petition, pick up some free “No Guns – No Money” business cards, and join IGO and receive a FREE T-Shirt! To volunteer to work at any one of the dozens of shows that we’ll be coming to in 2016, just click here! You Won’t See Aaron at the Gun Shows This Weekend!